I couldn't let today go by without mentioning the Man in Black himself – Johnny Cash! Born on this day, 26 February, in 1932, he went on to become an iconic figure in the world of American Country and Western music recording in excess of a staggering 1500 songs, broadening both the musical scope of the genre and its impact. He died on 12 September, 2003 in Nashville, Tennessee. 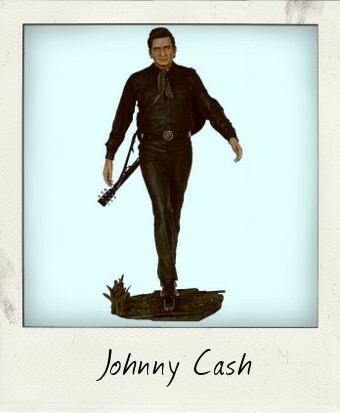 This Sota Toys Johnny Cash action figure has been enormously popular with both collectors and music fans ever since its release in 2006. It proved so popular, in fact, that the figure was re-released only two years later. The action figure stands 7 inches tall and includes a detachable rail-road track base - the figure “walks the line” as it were - and a guitar slung over his shoulders, which can also be removed. There is limited articulation with only the shoulders swivelling a little, but the paint job and sculpt are very impressive.